They gave her no choice. Sometimes I love a good UK quad because they can utilize the space and design a lot differently in a horizontal way than vertical with most posters, and that's certainly the case here. Empire has unveiled a new UK quad for Haywire, directed by Steven Soderbergh, the action flick starring Gina Carano as a female covert ops specialist who's betrayed and must hunt down everyone involved to survive. We've seen trailers aplenty for this, I even gave it a rather mediocre review from AFI Fest, but the imagery and marketing they're putting out for this still remains badass. See the latest Haywire poster in full below. Haywire is directed by Oscar winning filmmaker Steven Soderbergh, following up The Informant and The Girlfriend Experience, from a script by Lem Dobbs, of Soderbergh's The Limey, as well as Dark City and Kafka. 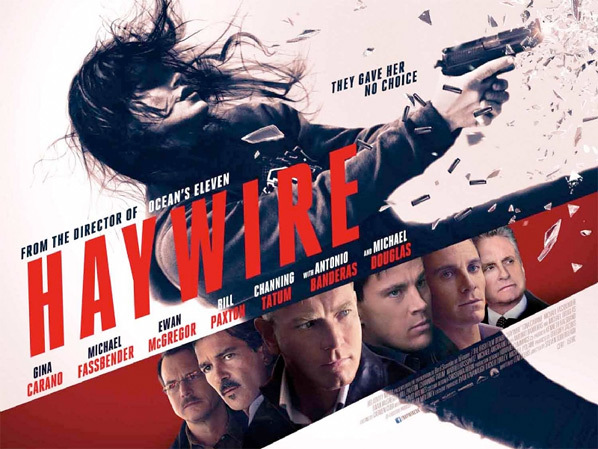 In Haywire, an electrifying tale of espionage and betrayal, a female covert ops specialist (Carano), who works in the deadly world of international operatives, strikes back after discovering she's been double-crossed by someone in the agency. The cast includes Channing Tatum, Ewan McGregor, Michael Douglas, Michael Fassbender, Antonio Banderas, Bill Paxton. Relativity is releasing Haywire on January 20, 2012. Like her pose and energy, but don't like the head collage, it's a bit clumsy and sloppy. Also, the colours seem a bit off, deeper dark tones in the collage than in the main image, which throws it out of balance a bit. She's probably on her period during the whole thing. Is that gun firing without the trigger being pulled? Nice. Good wrap on the grip though. Reminds me a lot of a James Jean Fables cover, looks alright like.